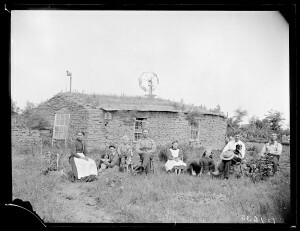 The dogs in the foreground, birdcage hanging from the soddie roof and birdhouse behind the soddie prove this family to be animal lovers. I can think of no better place for them to enjoy their passion than the Great Plains. In my living room sets a precious, worthless family heirloom; a birdcage stand. About 5 and 1/2 feet tall, it now serves as a hanging plant holder (the cage being long gone). It is rather plain and humble, but sturdy and extremely useful much like the woman I inherited it from, my great grandmother. When I think of its original purpose, I wonder what kinds of birds my great grandmother, and her mother before her, kept while spending their lives on the prairie of the Great Plains. I think it would be safe to say that the women in my pioneer family tree were not much different than many other women of the Plains a little more than 100 years ago. While some chose the adventuresome yet harsh life of a homesteader willingly, many did not. The simple fact was that westward expansion occurred in a man’s world, often times allowing women only a whisper in life altering decisions. However, it must be noted that many women, after arriving to their new prairie home, found a sense of freedom and independence that was previously elusive to them. Whether a pioneer woman resisted prairie life or embraced it, I believe many had common challenges, not the least of them being loneliness and depression. Unwilling to leave their friend behind, it looks like this bird made the journey with the family to their new home. The birdcage is a welcoming figure in the tent entrance. Judging from my own family stories, one strategy of the pioneer woman to combat these challenges was to employ the company of birds as companion animals. Using up little space or food, a bright cheery bird might have been a wife’s only distraction while spending weeks alone on her husband’s claim while he worked away to draw a wage. Or a single young lady, proving up on her own homestead (next to her father or brother perhaps) may have treasured a living being to talk to during those long black nights when the coyote’s call came close. And I wonder if a bird’s song helped soothe a mother’s memory of her laughing child where they once played. look closely, in many photos, there is another common item in the background — a birdcage. How did these small birds factor in to the complex history of the Great Plains? Granted, they are a tiny part of the story, but I believe no less important than more well-known facets of women’s lives on the prairie such as ladies clubs or quilting bees. Not unlike the canaries of historical mining operations, I view these pioneer pets as having served a very real and important purpose. The camaraderie these small birds offered surely served as an antidote to the huge expanses of treeless open space that so many women found intimidating. Incessant winds and extreme weather, constant worry over family health and food provision, long periods of isolation and lack of social outlets surely took their toll. I wonder how many lighthearted, colorful little birds helped keep a woman’s sanity. How did they help women in their daily struggles, offering a psychological aid to enable them to continue in a demanding life? 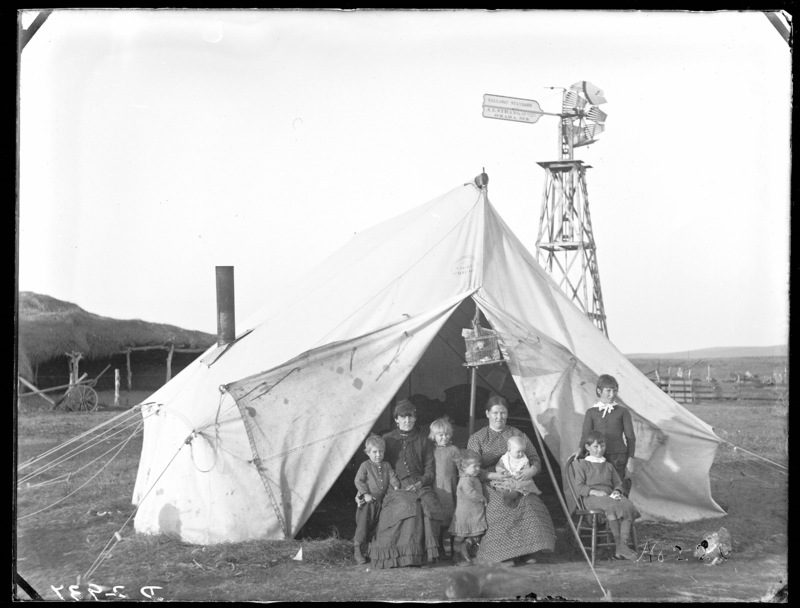 I’ll never fully understand how pioneer women coped with their many challenges. However, I am pleased to discover that they surely were not that much different than you or me. Who among us has not been soothed and sustained by nature? Whether it’s the sweetness in a bird’s song, the caress of a prairie stream or the unequaled grandeur of the night sky, nature offers us moments that can heal us, humble us and renew us. How does nature sustain you? Man, woman, or child, how do you find comfort, solace or inspiration in our natural world of the Great Plains? Share your story on our Facebook page…with a nod of appreciation to these bygone little birds, these unsung troubadours, of the prairie.